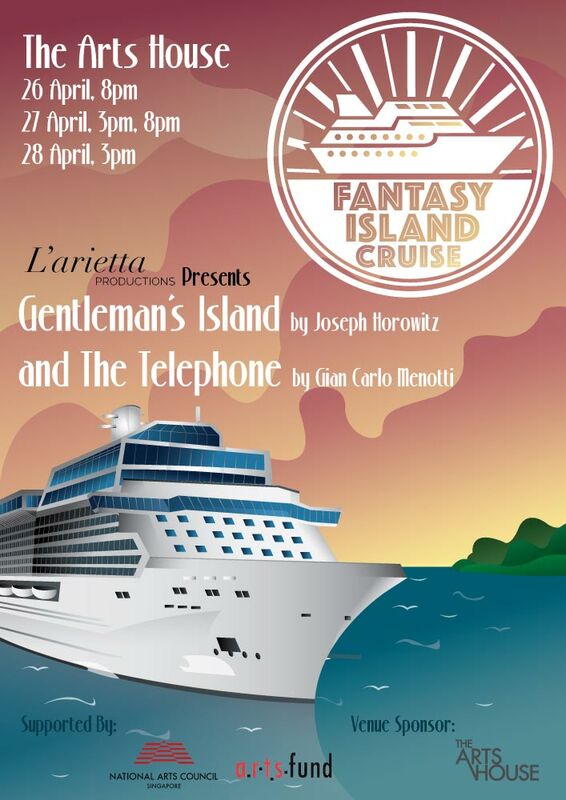 L’arietta Productions is proud to present FANTASY ISLAND CRUISE coming to you this April at the Arts House. This tropical adventure features the revival of the beloved Gentleman’s Island by Joseph Horovitz and a classic of chamber operas, The Telephoneby Gian Carlo Menotti. Dress up in your best Hawaiian shirt, enjoy an evening of comedy and drama along with an umbrella in your drink, opera style. Featuring veterans of the Singapore opera scene, Brent Allcock, Reuben Lai, Leslie Tay and Lilith Verhelst and directed by pillar of the Singaporean theatre scene Richard Tan, don’t miss this double bill! With the kind support of the Arts House, the show sets sail 26th-28th April, 2019 at the Play Den. Gentleman’s island tells a tale of two well bred gentlemen shipwrecked on a desert island. Their sense of manners prevents them from speaking to the other without being introduced by someone else first. Starvation and loneliness awaits if they cannot find a way around their circumstances. Written by British composer Joseph Horovitz, it is a sharply observed satire on the things that people hold important in life even to their own detriment. In The Telephone, Ben and Lucy are trying to have a conversation. He is trying to pop the question to the love of his life. Unfortunately for Ben, the phone is constantly getting in the way. Will he manage to get those four little words in before time runs out for him? Since its debut in 1948, this opera has never been more relevant in our seemingly interconnected age. About us: Incorporated in 2015, L’arietta Productions produce high quality bite-sized operas in English that are cozy, entertaining, and relevant. Collaborating with award winning artists to build operatic experiences; Straits Times regards L’arietta’s approach “vital in conveying the message that modern opera could be unstuffy, accessible and even fun.” Fantasy Island Cruise will be our 7th production. L’arietta Production is the proud winner of Best of Classical Music in the Straits Times Best & Worst of 2018.